Bespoke beauty… Hydradermie, an exceptional, non invasive, mechanical treatment, is at the heart of the Guinot experience. The Hydradermie machine’s gentle combination of mild galvanic and high frequency electrotherapy, results in a face that appears rested and luminous with a subtle glow having been deeply cleansed, hydrated and rejuvenated…. from the very first treatment. In fact, clinical tests results have revealed that, following a Hydradermie facial, the skin is 52% more hydrated. The combination of advanced scientific technology and the skills of a highly trained therapist together produce the ultimate in treatments, the Hydradermie Facial, to correct skin problems from the inside out. There are six different types of Hydradermie treatments available, depending on your beauty goals and skin type. Whether skin is normal/dry, dehydrated, mature, oily, sensitive or hyper-pigmented skin. Following a thorough skin preparation, your therapist assesses your skin and selects the treatment gels best suited to your skin type making The Hydradermie a truly customised treatment. 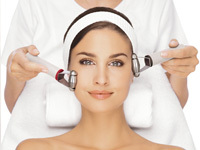 – gentle, precise massaging movements using rollers carry the specific gel serum deep into the skin. – to energise the skin’s cells, leaving the skin fully loaded with oxygen and a complexion that is relaxed, purified and bright. The treatment concludes with a relaxing massage, mask and the application of care products. Hydradermie Facials are recommended to be taken as a course of 3 treatments, one a week or as a monthly maintenance treatment.